Late July saw me in the south west primarily to join the celebrations at friends wedding in a stunning coastal location, and also gave me the opportunity to continue to the far corner of Cornwall for a seawatch at Porthgwarra on Sunday 26 July 2015. I love seawatching and overnight heavy rain with strong southerlies changing early morning to a blowy southwesterly as the front cleared the area mid morning had thoughts of a push of a few seabirds into Cornish waters. Cory's and Great 'Shears' already being seen over recent days in British and Irish waters. Whilst it was nice to see loads of Manx Shearwaters at close range, with a couple of Balearic Shearwaters thrown in, no large Shearwaters were seen between 09:45 and 12:00. 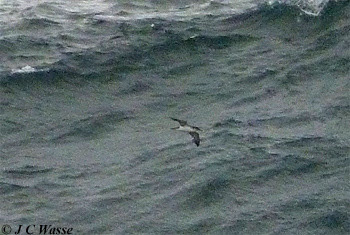 A Great Skua and mid distance Storm Petrel plus lots of Gannets, Fulmars and Kittiwakes added to the variety. I find it difficult to know where to focus on a seawatch at Porthgwarra. On this occasion it was easier to scan through the Manxies using bins as opposed to through the 'scope as the majority flew by just off Gwennap Head. When the front cleared the strong sunlight made viewing difficult on the 'silver' sea. It was instructive to see how the light changes the look of the Manx Shearwaters as they changed from clear cut black and white to a dusky brownish hue. 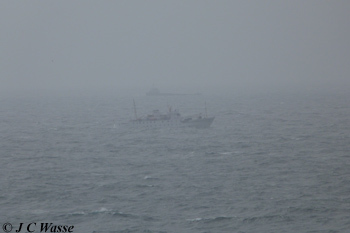 Before the weather improved the Scillonian passed by making light work of the choppy crossing to Scilly. Noted at Porthgwarra on the landward side were a pair of Choughs, a pair of Ravens, a pair of Carrion Crows and then the Jackdaws broke suit as a dozen flew over the cafe. Before driving back to London I caught up with the 1st Summer Ring-billed Gull and at least 20 Mediterranean Gulls roosting on RSPB Ryan's Field, Hayle Estuary. Moving forward a week I was back at Rainham Marshes RSPB on Saturday 01 August 2015. On the long walk from Rainham railway station a nice look at a Garden Warbler in scrub at the SE corner was a nice find. Good to catch up with the gang at the reserve and the six of us (RB, BC, PS, VW, PD and yours truly), comprising members of three '2015 Rainham Marshes bird race' teams, were treated to 7 Hobbies, several Buzzards and passage waders including Black-tailed Godwit (18), Greenshank (12), Whimbrel (4), Dunlin (4), Common (4), Green (2) and Wood (1) Sandpipers and LR Plover. Over 100 Swifts moved through. Having heard about Southern Migrant Hawker dragonflies showing at Wat Tyler CP, Pitsea over recent summers I twitched them on Sunday 02 August 2015 joining RB at this popular CP. We had stunning views of a confiding SM Hawker (aka Blue-eyed Hawker) by the Marina Kiosk pond, which would have an occasional 'barney' with another one who dared to enter this airspace. 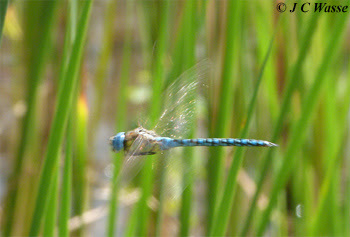 A walk around the CP produced 2 more SM Hawkers hunting along a path and at a small pond just west of the RSPB centre. Cheers to HV for advice in spotting them, check out HV's excellent photos and blog post. 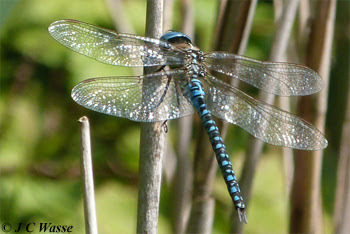 More photos of this stunning dragonfly at the 'Dragonflies' tab accessible via the top of the page. Back to Rainham Marshes RSPB where similar number of waders were still on Aveley Pools, hoping to nail the colour-ring combinations on a couple of passage Black-tailed Godwits. More on them in due course.